Laura Strickland, welcome to Romance Lives Forever. I’m Kayelle Allen, author and owner of this blog. Happy to have you here! Please tell us about your book. Tough Prospect is the story of Mitch Carter, a man who’s never had anything soft or easy in his life, meeting up with a woman who, in his eyes, personifies all that’s beautiful, soft, and feminine. Used to battling for everything he needs, he’s prepared to battle for Tessa too. What he doesn’t understand is, love doesn’t respond to force and sometimes must be wooed with a gentle touch. He’ll have to open his heart and become vulnerable, before he succeeds in winning her, and for him that’s the hardest prospect of all. from you in coming months? 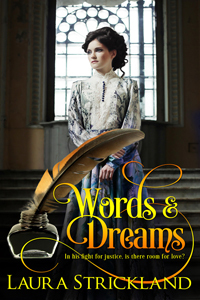 his dreams into his own words—and the only sure way to see her again. seventeenth book with The Wild Rose press.